Many Excel 2007-2016 commands do not appear anywhere in the Ribbon, including some that used to be on the menus in Excel 2003. These commands still exist but you have to do something to make them available. There are three ways you can make these commands and many others available. Note: the screenshots are from Excel 2007 but are almost the same in 2010-2016. 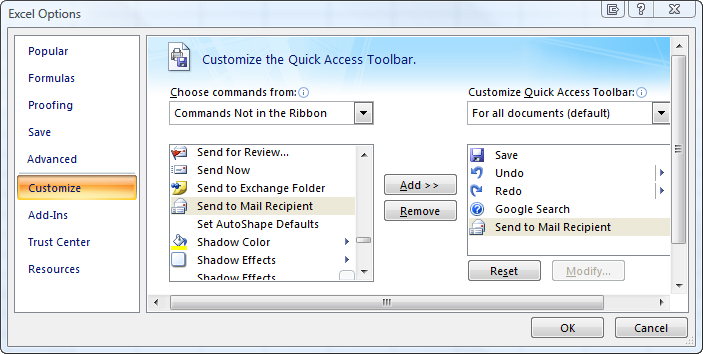 Right click on the QAT and choose Customize Quick Access Toolbar. In the "Choose commands from" dropdown choose "Commands Not in the Ribbon". Then select the command you want in this long list and press "Add"
Note: In the "Customize Quick Access Toolbar" dropdown choose "For <workbook name>"
if you want to add the commands only to the QAT for this workbook. If you want to add missing commands to your own custom Ribbon tab in Excel 2007-2016 you must know the RibbonX name for the command that you want to add to the Ribbon tab. The idMso of the command you can find like this, point to the command in the "Commands Not in the Ribbon" list with your mouse and you see this. We search for this idMso SendCopySendToMailRecipient in the file you just download. You will find the Type of the command (button, toggleButton or ?) on the same row in this file. Now we have enough information to create this line to add the command. The RibbonX below will create a new tab on the Ribbon with a few example commands. You can save the workbook with the RibbonX below as a add-in if you want to use the commands in all your workbooks. Note: If you not know how to add RibbonX to your workbook check out my Ribbon start page.